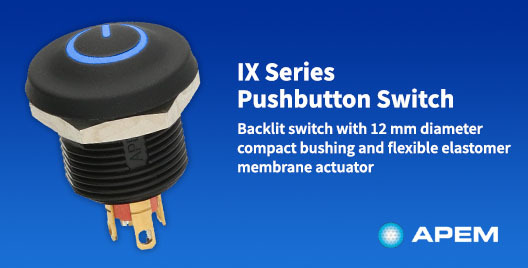 APEM's New IX Series Pushbutton Switch » Electronic Salesmasters Inc.
APEM’s new IX Series pushbutton switch was designed with the most demanding markets in mind. Featuring a flexible elastomer membrane actuator, the IX is waterproof with an IP69K sealing. The IX series features a flexible elastomer membrane actuator, with no space between the actuator and bushing, guaranteeing an IP69K panel sealing. This provides excellent resistance to frost, sand and other contaminants. The ultra-thin design has a great ergonomic advantage with a tight matrix mounting. The IX series pushbutton offers a large selection of customization. Choose from 9 different actuator colors, illuminated markings with 5 different LED colors and several different marking symbols. Illumination can also be limited to just the symbol, or the entire membrane actuator.